The 2009 challenge, “Lunacy,” (FRC 2009 Game Animation) involved familiar ball play as well as introducing helpful camera tracking and a one sixth gravity simulation by using a ‘regolith’ field surface of fiberglass reinforced panels. The target for the balls this particular year was a trailer towed by the other alliance which made for an interesting game of chase. 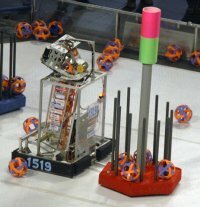 Our experience and success with ball manipulation in 2006 with the Aim High game drove our decision to design and build a shooter similar to the one on our 2006 robot. We determined that the robot would include a two wheeled shooter with camera tracking and a harvesting mechanism that fed into the shooter. We realized that despite the slippery regolith field it would be extremely advantageous to have a fast maneuvering robot, since a stationary or slow robot’s trailer could easily be scored on by opponents. To solve this we had a traction control system that had “follower wheels” that recorded the speed of the robot and kept it from slipping. At the unveiling event hosted by BAE Systems, we were one of several teams with only partially functioning robots and not much time to waste. In the four remaining days of build-season, we managed to attain our goals of agility and and scoring capability. 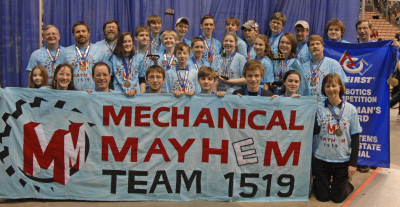 The robot’s performance at the Granite State Regional was commendable. Excelling as a scoring robot, we were seeded 10th in qualifiers and allied with Kaizen Blitz (1276) and The Red Devils (87), ready to venture into the elimination rounds. Despite our poor performance in quarter finals, causing us to drop out of the competition, we were honored to win the Website Award and Chairman’s Award, which qualified us for Championships in Atlanta, Georgia. We spent the weeks following GSR frantically racing to improve the shooter’s performance, and when it was time to pack up for the Atlanta competition, it had been significantly enhanced. It took much of the first day of championships to replace the GSR shooter with the new one, but it was well worth it, placing us in 11th place at the end of qualifiers. Since the caliber of the opponents was much much higher in Atlanta, Georgia than in New Hampshire, we were not picked for the elimination rounds. Nonetheless, we were pleased with our overall performance. In 2009 our team attended several off-season tournaments, in which most of the students got a chance to be on the drive team. The first competition we attended was BattleCry at WPI, where we made it to quarter finals. Early in the day at Mayhem in Merrimack, a small group of new drivers brought us to 4th place. Once other students returned from SAT testing our usual drive team took over. The robot behaved mechanically, but we were not able to get the camera tracking to work. We lost in the loser’s bracket. (Proposed Change: The robot performed well mechanically…this prevented us from performing as well as we could have, and we ended up losing the semifinals) Bash at the Beach was our first tournament of the fall, and a small but eager crew made the trip down to Connecticut. New students took on some of the drive team roles. As the last off-season tournament of the year, River Rage provided one more opportunity for new students to try driving. Because other robots had higher scoring capabilities, we took a defensive stance and qualified as top seed. Allied with Gael Force, we won the tournament.